Top　»　Exhibitions　»　"Ametsuchi no Hajime"
Bambinart Gallery is pleased to annonce the joint exhibition by Azumi Sakata and Ayao Shikawa "Ametsuchi no Hajime". Azumi Sakata makes embroidered "creatures" out of cloth and thread while Ayao Shikawa depicts an imaginary world using wood-block print. These works come to the viewer as completely new creatures not part of Darwinin evolution but, at the same time, makes one wonder if they were always there by your side--you just never cared to notice. The ancient Japanese text, Kojiki, begins with the line "Ametsuchi hajimete hirakeshitoki (When heaven and earth first opened themselves)". It describes the world in its nascent chaos where heaven and earth were still undevided. Later, various gods come to the scene and divide the heaven from earth, form our nation, and create all living creatures. This line from Kojiki could not help but bring to mind our situation now after the quake. Azumi Sakata portrays what she saw through her inner eye by transposing her emotions into other things such as coccoons, mummies, and dolls. 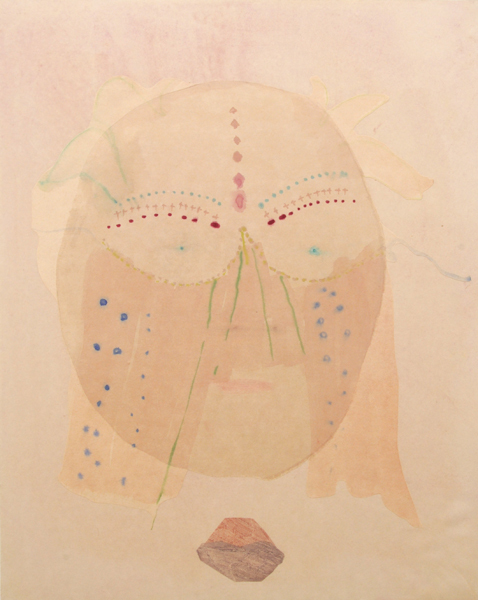 Her drawings, embroideries, and collages are her attempts at finding the conditions for peace. She also uses drapes and folds in cloth as allusions to passing time and repeated emotions. Her collages sealed in transparent panels resemble cased artifacts in museums. But instead of them being sad reminders of the past, they are shed old skin so we can move on to the future. Ayao Shikawa finds inspiration in her experiences and imagination. She uses wood print but her works are not reproduced; she "draws" using wood-blocks on washi-paper. Images vary from primitive figures to animals, plants, and faces but they all carry an ephemeral quality in their faint colors. At the same time, the images embody warmth that makes the viewer smile. Shikawa's works have been enjoyed by many as could be seen from the fact that her work won first prize in the Mont Blanc Young Artists Patronage in Japan Project 2010 held at Mont Blanc Ginza last year.